↑ Ben-Ami Scharfstein (1993). Ineffability: The Failure of Words in Philosophy and Religion. State University of New York Press. पृ॰ 166. आई॰ऍस॰बी॰ऍन॰ 978-0-7914-1347-0. , Quote: "Krishna, god of love, (...)"
↑ Edwin Bryant & Maria Ekstrand 2004, पृ॰प॰ 20–25, Quote: "Three Dimensions of Krishna's Divinity (...) divine majesty and supremacy; (...) divine tenderness and intimacy; (...) compassion and protection. ; (..., p.24) Krishna as the God of Love". ↑ Bryant 2007, पृ॰ 114. ↑ अ आ John Stratton Hawley, Donna Marie Wulff (1982). The Divine Consort: Rādhā and the Goddesses of India. Motilal Banarsidass Publisher. पृ॰ 12. आई॰ऍस॰बी॰ऍन॰ 9780895811028. ↑ Bryant 2007, पृ॰ 443. ↑ "श्री कृष्ण का नामकरण संस्कार". वेबदुनिया. वेब दुनिया. अभिगमन तिथि 14 अप्रैल 2018. ↑ Hiltebeitel, Alf (2001). Rethinking the Mahābhārata: a reader's guide to the education of the dharma king. Chicago: University of Chicago Press. पपृ॰ 251–53, 256, 259. आई॰ऍस॰बी॰ऍन॰ 0-226-34054-6. ↑ T. Richard Blurton (1993). Hindu Art. Harvard University Press. पपृ॰ 133–134. आई॰ऍस॰बी॰ऍन॰ 978-0-674-39189-5. ↑ Guy, John (7 April 2014). Lost Kingdoms: Hindu-Buddhist Sculpture of Early Southeast Asia. Metropolitan Museum of Art. पपृ॰ 222–223. आई॰ऍस॰बी॰ऍन॰ 978-1-58839-524-5. ↑ The Encyclopedia Americana. [s.l. ]: Grolier. 1988. पृ॰ 589. आई॰ऍस॰बी॰ऍन॰ 0-7172-0119-8. ↑ Benton, William (1974). The New Encyclopædia Britannica. Encyclopædia Britannica. पृ॰ 885. आई॰ऍस॰बी॰ऍन॰ 9780852292907. ↑ Ariel Glucklich (2008). The Strides of Vishnu: Hindu Culture in Historical Perspective. Oxford University Press. पृ॰ 106. आई॰ऍस॰बी॰ऍन॰ 978-0-19-971825-2. ↑ T. A. Gopinatha Rao (1993). Elements of Hindu iconography. Motilal Banarsidass. पपृ॰ 210–212. आई॰ऍस॰बी॰ऍन॰ 978-81-208-0878-2. ↑ Hoiberg, Dale; Ramchandani, Indu (2000). Students' Britannica India. Popular Prakashan. पृ॰ 251. आई॰ऍस॰बी॰ऍन॰ 9780852297605. ↑ Satsvarupa dasa Goswami (1998). "The Qualities of Sri Krsna". GNPress: 152 pages. आई॰ऍस॰बी॰ऍन॰ 0-911233-64-4. ↑ Vithoba is not only viewed as a form of Krishna. He is also by some considered that of Vishnu, Shiva and Gautama Buddha according to various traditions. See: Kelkar, Ashok R.. (2001)। "Sri-Vitthal: Ek Mahasamanvay (Marathi) by R. C. Dhere". Encyclopaedia of Indian literature 5: 4179। Sahitya Akademi। अभिगमन तिथि: 2008-09-20 and Mokashi, Digambar Balkrishna; Engblom, Philip C. (1987). Palkhi: a pilgrimage to Pandharpur — translated from the Marathi book Pālakhī by Philip C. Engblom. Albany: State University of New York Press. पृ॰ 35. आई॰ऍस॰बी॰ऍन॰ 0-88706-461-2. ↑ Tryna Lyons (2004). The Artists of Nathadwara: The Practice of Painting in Rajasthan. Indiana University Press. पपृ॰ 16–22. आई॰ऍस॰बी॰ऍन॰ 0-253-34417-4. ↑ Kunissery Ramakrishnier Vaidyanathan (1992). Sri Krishna, the Lord of Guruvayur. Bharatiya Vidya Bhavan. पपृ॰ 2–5. ↑ T. A. Gopinatha Rao (1993). Elements of Hindu iconography. Motilal Banarsidass. पपृ॰ 201–204. आई॰ऍस॰बी॰ऍन॰ 978-81-208-0878-2. ↑ Wendy Doniger (2008). "Britannica: Mahabharata". encyclopedia. Encyclopædia Britannica Online. अभिगमन तिथि 2008-10-13. ↑ Audouin, Rémy, and Paul Bernard, "Trésor de monnaies indiennes et indo-grecques d'Aï Khanoum (Afghanistan). II. Les monnaies indo-grecques." Revue numismatique 6, no. 16 (1974), pp. 6–41 (in French). ↑ Gopal, Madan (1990). K.S. Gautam, संपा॰. India through the ages. Publication Division, Ministry of Information and Broadcasting, Government of India. पृ॰ 73. ↑ Richard Salomon (1998). Indian Epigraphy: A Guide to the Study of Inscriptions in Sanskrit, Prakrit, and the other Indo-Aryan Languages. Oxford University Press. पपृ॰ 265–267. आई॰ऍस॰बी॰ऍन॰ 978-0-19-535666-3. ↑ Benjamín Preciado-Solís (1984). The Kṛṣṇa Cycle in the Purāṇas: Themes and Motifs in a Heroic Saga. Motilal Banarsidass. पृ॰ 34. आई॰ऍस॰बी॰ऍन॰ 978-0-89581-226-1. ↑ Manohar Laxman Varadpande (1982). Krishna Theatre in India. Abhinav Publications. पपृ॰ 6–7. आई॰ऍस॰बी॰ऍन॰ 978-81-7017-151-5. ↑ Barnett, Lionel David (1922). Hindu Gods and Heroes: Studies in the History of the Religion of India. J. Murray. पृ॰ 93. ↑ Richard Salomon (1998). Indian Epigraphy: A Guide to the Study of Inscriptions in Sanskrit, Prakrit, and the Other Indo-Aryan Languages. Oxford University Press. पपृ॰ 86–87. आई॰ऍस॰बी॰ऍन॰ 978-0-19-509984-3. ↑ Elkman, S. M.; Gosvami, J. (1986). Jiva Gosvamin's Tattvasandarbha: A Study on the Philosophical and Sectarian Development of the Gaudiya Vaisnava Movement. Motilal Banarsidass. ↑ The Poems of Sūradāsa. Abhinav publications. 1999. ↑ Lynne Gibson (1999). Merriam-Webster's Encyclopedia of World Religions. Merriam-Webster. पृ॰ 503. ↑ "Yashoda and Krishna". Metmuseum.org. 2011-10-10. मूल से 13 October 2008 को पुरालेखित. अभिगमन तिथि 2011-10-23. ↑ Sanghi, Ashwin (2012). The Krishna key (अंग्रेज़ी में). Chennai: Westland. पृ॰ Key7. आई॰ऍस॰बी॰ऍन॰ 9789381626689. अभिगमन तिथि 9 June 2016. ↑ Lok Nath Soni (2000). The Cattle and the Stick: An Ethnographic Profile of the Raut of Chhattisgarh. Anthropological Survey of India, Government of India, Ministry of Tourism and Culture, Department of Culture, Delhi: Anthropological Survey of India, Government of India, Ministry of Tourism and Culture, Department of Culture, 2000 Original from the University of Michigan. पृ॰ 16. आई॰ऍस॰बी॰ऍन॰ 978-8185579573. ↑ Diana L. Eck (2012). India: A Sacred Geography. Harmony. पपृ॰ 380–381. आई॰ऍस॰बी॰ऍन॰ 978-0-385-53190-0. , Quote: "Krishna was shot through the foot, hand, and heart by the single arrow of a hunter named Jara. Krishna was reclining there, so they say, and Jara mistook his reddish foot for a deer and released his arrow. There Krishna died." ↑ Mani, Vettam (1975). Puranic Encyclopaedia: A Comprehensive Dictionary With Special Reference to the Epic and Puranic Literature. Delhi: Motilal Banarsidass. पृ॰ 429. आई॰ऍस॰बी॰ऍन॰ 0-8426-0822-2. ↑ Rao, Shanta Rameshwar (2005). Krishna. New Delhi: Orient Longman. पृ॰ 108. आई॰ऍस॰बी॰ऍन॰ 9788125026969. ↑ George Mason Williams (18 June 2008). Handbook of Hindu Mythology. Oxford University Press. पपृ॰ 188, 222. आई॰ऍस॰बी॰ऍन॰ 978-0-19-533261-2. अभिगमन तिथि 10 March 2013. ↑ Jeaneane D. Fowler (2012). The Bhagavad Gita: A Text and Commentary for Students. Sussex Academic Press. पपृ॰ 1–7. आई॰ऍस॰बी॰ऍन॰ 978-1-84519-520-5. ↑ Eknath Easwaran (2007). The Bhagavad Gita: (Classics of Indian Spirituality). Nilgiri Press. पपृ॰ 21–59. आई॰ऍस॰बी॰ऍन॰ 978-1-58638-019-9. ↑ Benjamín Preciado-Solís (1984). The Kṛṣṇa Cycle in the Purāṇas: Themes and Motifs in a Heroic Saga. Motilal Banarsidass. पृ॰ 40. आई॰ऍस॰बी॰ऍन॰ 978-0-89581-226-1. , Quote: "Within a period of four or five centuries [around the start of the common era], we encounter our major sources of information, all in different versions. The Mahabharata, the Harivamsa, the Visnu Purana, the Ghata Jataka, and the Bala Carita all appear between the first and the fifth century AD, and each of them represents a tradition of a Krsna cycle different from the others". ↑ Knott, Kim (2000). Hinduism: A Very Short Introduction. Oxford University Press, USA. आई॰ऍस॰बी॰ऍन॰ 0-19-285387-2. ↑ Vemsani, Lavanya (2016). Krishna in History, Thought, and Culture: An Encyclopedia of the Hindu Lord of Many Names: An Encyclopedia of the Hindu Lord of Many Names. ABC-CLIO. पृ॰ 212. ↑ Hermann Kulke; Dietmar Rothermund (2004). A History of India. Routledge. पृ॰ 149. आई॰ऍस॰बी॰ऍन॰ 978-0-415-32920-0. ↑ Sharma; B. N. Krishnamurti (2000). A History of the Dvaita School of Vedānta and Its Literature. Motilal Banarsidass. पपृ॰ 514–516. आई॰ऍस॰बी॰ऍन॰ 978-8120815759. ↑ Tripurari, Swami. "The Life of Sri Jiva Goswami". Harmonist. मूल से 24 March 2013 को पुरालेखित. ↑ Christophe Jaffrelot (1998), The Hindu Nationalist Movement in India, Columbia University Press, ISBN 978-0-231-10335-0, page 2, Quote: "The main current of Hinduism – if not the only one – which became formalized in a way that approximates to an ecclesiastical structure was that of Shankara". ↑ John Dowson (2003). Classical Dictionary of Hindu Mythology and Religion, Geography, History and Literature. Kessinger Publishing. पृ॰ 361. आई॰ऍस॰बी॰ऍन॰ 0-7661-7589-8. ↑ Klostermaier, Klaus K. (2005). A Survey of Hinduism. State University of New York Press; 3 edition. पपृ॰ 203–204. आई॰ऍस॰बी॰ऍन॰ 0-7914-7081-4. Present day Krishna worship is an amalgam of various elements. According to historical testimonies Krishna-Vasudeva worship already flourished in and around Mathura several centuries before Christ. A second important element is the cult of Krishna Govinda. 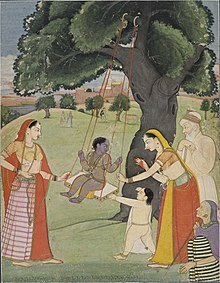 Still later is the worship of Bala-Krishna, the Child Krishna—a quite prominent feature of modern Krishnaism. The last element seems to have been Krishna Gopijanavallabha, Krishna the lover of the Gopis, among whom Radha occupies a special position. In some books Krishna is presented as the founder and first teacher of the Bhagavata religion. ↑ Basham, A. L. (May 1968). "Review: Krishna: Myths, Rites, and Attitudes. by Milton Singer; Daniel H. H. Ingalls". The Journal of Asian Studies. 27 (3): 667–670. JSTOR 2051211. ↑ Klostermaier, K. (1974). "The Bhaktirasamrtasindhubindu of Visvanatha Cakravartin". Journal of the American Oriental Society. American Oriental Society. 94 (1): 96–107. JSTOR 599733. डीओआइ:10.2307/599733. ↑ Jacobsen, Knut A., संपा॰ (2005). Theory And Practice of Yoga: Essays in Honour of Gerald James Larson. Brill Academic Publishers. पृ॰ 351. आई॰ऍस॰बी॰ऍन॰ 90-04-14757-8. ↑ Bowen, Paul (1998). Themes and issues in Hinduism. London: Cassell. पपृ॰ 64–65. आई॰ऍस॰बी॰ऍन॰ 0-304-33851-6. ↑ Radhakrisnasarma, C. (1975). Landmarks in Telugu Literature: A Short Survey of Telugu Literature. Lakshminarayana Granthamala. ↑ Sisir Kumar Das (2005). A History of Indian Literature, 500–1399: From Courtly to the Popular. Sahitya Akademi. पृ॰ 49. आई॰ऍस॰बी॰ऍन॰ 81-260-2171-3. ↑ Peter Clarke (2005), Encyclopedia of New Religious Movements, Routledge, ISBN 978-0415267076, page 308 Quote: "There they captured the imagination of The Beatles, particularly George Harrison who helped them produce a chart topping record of the Hare Krishna mantra (1969) and ...". ↑ Triguṇa (Mpu. ); Suwito Santoso (1986). Krĕṣṇāyana: The Krĕṣṇa Legend in Indonesia. IAIC. OCLC 15488486. ↑ Law, B. C. (1941). India as Described in Early Texts of Buddhism and Jainism. Luzac. पपृ॰ 99–101. ↑ Jaiswal, S. (1974). "Historical Evolution of the Ram Legend". Social Scientist. 21 (3–4): 89–97. JSTOR 3517633. ↑ Esslemont, J. E. (1980). Bahá'u'lláh and the New Era (5th संस्करण). Wilmette, Illinois, USA: Bahá'í Publishing Trust. पृ॰ 2. आई॰ऍस॰बी॰ऍन॰ 0-87743-160-4. ↑ Minahan, James (2012). Ethnic groups of South Asia and the Pacific: An Encyclopedia. Santa Barbara, USA: ABC-CLIO. पपृ॰ 6–8. आई॰ऍस॰बी॰ऍन॰ 978-1-59884-659-1. ↑ Harvey, D. A. (2003). "Beyond Enlightenment: Occultism, Politics, and Culture in France from the Old Regime to the Fin-de-Siècle". The Historian. Blackwell Publishing. 65 (3): 665–694. डीओआइ:10.1111/1540-6563.00035. ↑ Schure, Edouard (1992). Great Initiates: A Study of the Secret History of Religions. Garber Communications. आई॰ऍस॰बी॰ऍन॰ 0-89345-228-9. ↑ See for example: Hanegraaff, Wouter J. (1996). New Age Religion and Western Culture: Esotericism in the Mirror of Secular Thought. Brill Publishers. पृ॰ 390. आई॰ऍस॰बी॰ऍन॰ 90-04-10696-0. , Hammer, Olav (2004). Claiming Knowledge: Strategies of Epistemology from Theosophy to the New Age. Brill Publishers. पपृ॰ 62, 174. आई॰ऍस॰बी॰ऍन॰ 90-04-13638-X. , and Ellwood, Robert S. (1986). Theosophy: A Modern Expression of the Wisdom of the Ages. Quest Books. पृ॰ 139. आई॰ऍस॰बी॰ऍन॰ 0-8356-0607-4.